Pre-slaughter handling has been increasingly scrutinized and handling practices appear to have improved, but there is still great variation between abattoirs. Objective methods of scoring and quantifying pig welfare are needed to ensure compliance with legislation and consumer needs. Different methods for monitoring animal welfare at abattoirs have been developed and scoring systems differ between food chains. Generally a scoring system should be simple to use under commercial conditions and minimal training should be required to conduct an assessment. It is very important that scoring is objective and standardized so that all observers may obtain similar results. Objective measurements include recording the number of animals that are prodded and how many animals fall or slip. Scoring when animals are vocalizing is also a common variable. Pigs are very social animals that naturally live in stable groups and therefore when they vocalize this may be taken as valid indicator. In pigs, high-pitched vocalizations (HPV) are strongly associated with fear, distress and/or pain and discomfort. Besides being an indication of a negative emotional state in the vocalizing animal, HPVs also cause further stress to pigs that hear them. 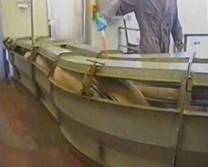 Vocalization scoring has therefore been used to address animal welfare problems at abattoirs. Two different driving systems resulting in different noise levels. Videos: Sophie Atkinson and DMRI. 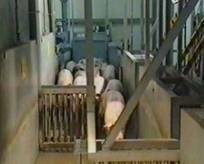 Click on the photographs to listen to the sound of pigs in two different abattoirs using different systems for driving pigs to stunning.